Joe drove up from San Diego on Friday night and spent the night at our house. We awoke at 5:00 a.m. on Saturday morning to catch a 7:10 JetBlue flight out of Long Beach Airport, a relic right out of the 1960s. My wife dropped us off at the airport about an hour before our departure time, we checked our baggage, headed to Gate 1, and boarded the airplane on time. We had aisle seats in row 3, complete with extra leg room (at a price, of course). Both of us were also lucky that the seats next to us were empty (no extra price . . . just the luck of the draw) despite the fact that the plane was relatively full. We took off on time and arrived 30 minutes early. An Early Wynn for us (more on him later). All in all, the flight experience was as pleasant as possible. If JetBlue can't spin much of a profit, I don't know how any airline can. As I like to tell clients who ask about investing in airline stocks, "Any time the market is open is a good time to sell these stocks." As it relates to JetBlue, a good company doesn't always equate to a good stock (JBLU). The gentleman on my left was a UCLA provost and the woman on Joe's right was a mother of two students currently attending USC. We chit chatted with our aisle partners, then settled in switching between watching DirecTV – one of the greatest features on any airline – and listening to our iPods. To change up our choice of songs, we even exchanged iPods for part of the trip. I mean, if not then, when would I ever listen to Jay-Z and LBC's own Snoop Dogg? While watching Jennie Finch pitching softball for Team USA on one of the scores of channels on DirecTV, Joe leaned across the aisle and asked me, "What do you notice differently about the catcher (she was lefthanded)?" Without hesitating, I said, "No cup?" Rim shot. The game ended with – appropriately enough – Roger Maris. My Dad was at Yankee Stadium on October 1, 1961 when Maris hit his record-breaking 61st home run off Boston's Tracy Stallard. The Dodgers were on an east coast road trip and he flew to New York to cover this event. Forty-seven years later, Joe and I will watch games in Boston and New York. Upon landing at Logan Airport, we took a taxi to the Hotel Commonwealth. 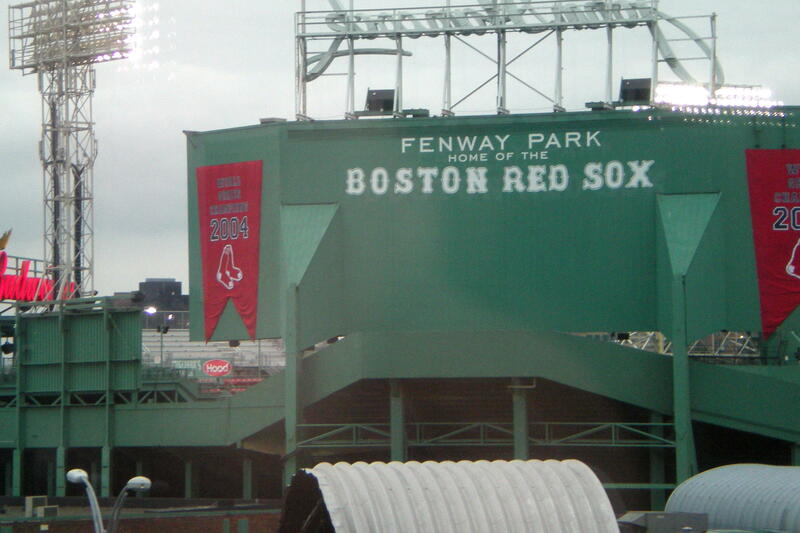 It is directly across the highway from Fenway Park. The photo at the left was shot from the window of our room. After getting situated, we took a stroll past Boston University, then reversed course and walked to Newbury Street. We ate dinner at none other than Joe's American Bar and Grill. My son has no ownership stake in the restaurant. We returned to the hotel around 8:00 and watched Tampa Bay and the Red Sox battle it out on NESN. It wasn't much of a battle as Boston blew out the Rays, 12-4. Off to breakfast with Sully, Jared Porter, and Bill James, followed by a Sunday game at Fenway. I'll be back on later tonight or tomorrow morning. Rich, that sounds like a great game. So special the relationship you've got with your son. I know you guys well enough to know that you appreciate it. But I'm just sayin...it's pretty cool. Can't wait to read the entire travelogue. That's two minutes of my life I wish I could have back. "October 1, 1961 when Maris hit his record-breaking 61st home run off Boston's Tracy Stallard. The Dodgers were on an east coast road trip and he flew to New York to cover this event. Thirty-seven years later, Joe and I will watch games in Boston and New York." Uhh, Rich...that's forty-seven years later. You're so right. Forty-seven years it is. I guess I'm older than I would like to think. Yikes. Looking forward to hooking up with you and Alex on Friday. Maybe we can get to the park early and talk to Dusty about the consequences of walks and clogging up the bases!